So I never really told you guys exactly why I was leaving for California. Basically, I have a new room (and house) to decorate! I'm on a tight spending budget but I'll whet your appetite with a few photos of my room so far. I hope you all enjoy!! I now have a duvet cover that matches the floral pillows. :) My bed is soooo AMAZING!! I LOVE my new bedside tables, lamps, and my alarm clock. This one (round one) is from Ikea, so is the alarm clock. This bedside table is rounder and stockier than the other one so I decided to pair it with a round lamp. The lamps and shades are from Ikea. They sold the lamps I have in white ceramic, but I decided that too much white would get really heavy in the room. 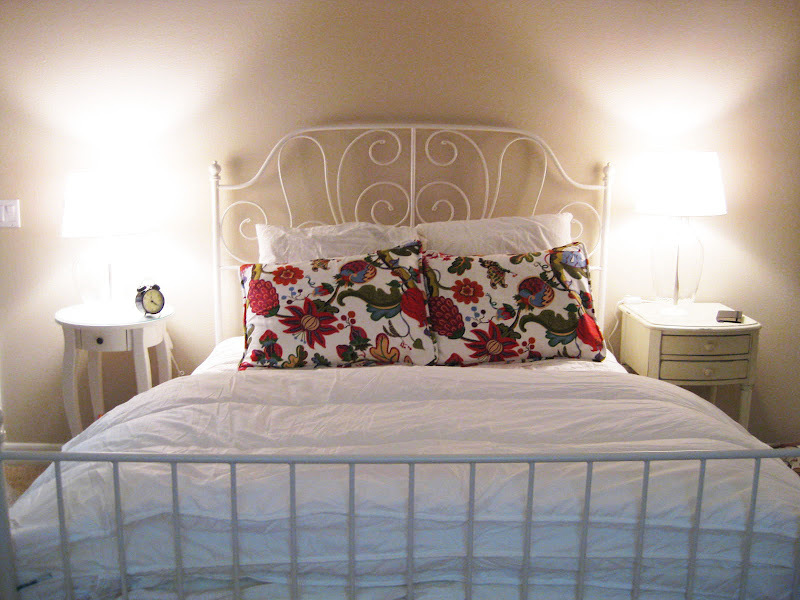 However, I still wanted something white-- I didn't want the lamps to be strong accents. The glass base lamps were the perfect find. The glass really lightens up the room with it's interesting and playful shape. I found this Klimt painting at Ikea (yay, I LOVE Ikea!!) I needed something long to fill up a wide wall, but ended up moving my bed where the painting would have gone. I found a new wall for my painting, which matches surprisingly well with my duvet cover. **UPDATE** I forgot to say the room cost a grand total of ~ 800 USD. Not bad. omg. you've got a HUGE bed! and it looks uber comfy too! i love the way you match white duvet with the floral pillow cases, the contra adds a touch of vintage-ness to the whole bed. and that's a nice table lamp!